Dr. Victor Van Phan received his medical education at Des Moines University in Iowa. He completed his internship and residency at Horizons Health System/Henry Ford Hospital in Detroit, Michigan, where he served as chief intern and chief resident. Board certified by the American Osteopathic Board of Orthopedic Surgery, Dr. Phan has been in practice since 2003. His clinical interests include joint reconstruction and replacement, sports medicine, trauma and fracture care. Dr. Phan’s patient philosophy is to be straight forward, honest and empathetic. He likes to think of his patients as friends or family members. He speaks Vietnamese and Spanish. 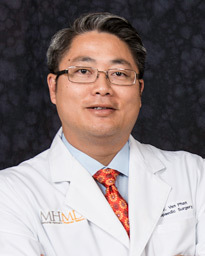 Dr. Phan has served as chief of Orthopedics at Memorial Hermann Southeast Hospital where he currently serves as Joint medical director. He is a member of the American Academy of Orthopaedic Surgeons, Osteopathic Medical Association and serves as a board examiner for the American Osteopathic Academy Orthopedics. Married to his elementary school sweetheart, Dr. Phan and his wife have three daughters. In his spare time, he enjoys vintage car racing and working on old cars, but most of all he loves being with his family. Victor Van Phan was just 4 years old and the youngest of 12 when most of his family escaped from Vietnam. Today, he a successful orthopedic surgeon and a better doctor because of his own pain. Relieve Your Knee or Hip Pain With Joint Replacement Surgery. Dr. Victor Van Phan and patient Sherry O’Neal shares how you can get relief from joint pain.